This story was featured in our ELECTricity newsletter in September 2017. Sign up to receive more success stories from election offices across the country. And how is your election office using technology to run excellent elections? Tell us about it by emailing kurt@techandciviclife.org -- we'd love to share your story! In every community -- large and small, red state and blue state alike -- encouraging civic participation is an ongoing challenge. No matter whether turnout is 20% or 80%, election officials recognize that a healthy democracy relies on the active involvement of all citizens. Rhode Island may be the nation’s smallest state, but it’s come up with some big ideas for motivating people to vote. The Rhode Island Department of State’s innovative RI Votes website goes beyond just providing civic information. 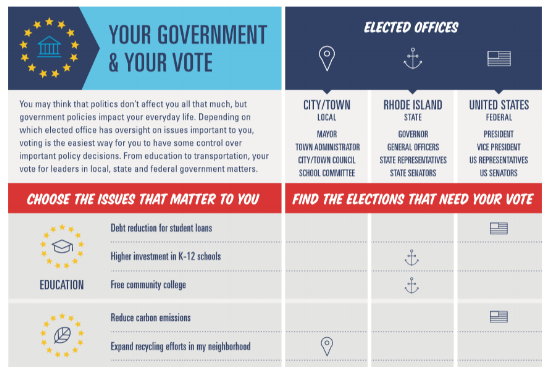 Using interactive design, RI Votes addresses visitors with a straightforward, relatable voice, guiding them through the information they need while offering inspiration along the way. Although it’s useful for everybody, RI Votes is focused on reaching young adults in the Ocean State. That’s because, according to Nicole Lagace, who’s Senior Advisor and Director of Communications at the Department, young people have a history of low turnout here. Nicole reports that just 17% of Rhode Island voters between the ages of 18 and 29 turned out for that November 2014 election, which included major contests for Governor, Secretary of State, and seats in the U.S. House and Senate. To help tackle this problem, the Department sought out -- and received -- a grant from the John S. and James L. Knight Foundation’s Knight Prototype Fund. With the grant, Department staff founded a civic fellowship program for high school students, and the ideas for RI Votes came from brainstorming with these fellows. The Rhode Island Department of State’s Civic Fellows discuss outreach ideas. Photo by Joe Graziano. Nicole and Director of Community Relations Jason Hernandez led a team to develop the site. Working with Content and Social Media Specialist Joe Graziano, Nicole drafted content and scripts. Jason worked with fellows and found volunteers to be filmed for the video content. Director of Elections Rob Rock verified that information was complete and accurate. And the Department worked with vendors Lakuna Design, Xzito, and Kevin Issa for design, web development, and video production, respectively. RI Votes launched in the fall of 2016 -- just in time to help people register in preparation for the Presidential Election. Most election websites are informative but not persuasive. What makes RI Votes so unusual is that it’s both. As a starting point, Nicole and Jason’s team wanted to understand the reasons why young people are reluctant to participate in elections. Then, they wanted to challenge each of those concerns with a counterargument. If you answer “yes,” the site gives information about registering, options for voting, and details to help you prepare. But if you answer “Don’t know,” the site gears up to offer support. The videos are an essential part of the website’s voice. Kevin Issa and Jason Hernandez film intern Kathryn Dery for one of the RI Votes videos. Photo by Joe Graziano. In another persuasive move, RI Votes emphasizes how each level of government impacts issues that voters care about. To do that, the team created an infographic to show how key issues like education and the economy are shaped at the local, state, and federal levels, visualizing the importance of each. Finally, to make the website’s content more usable, the team used plain language instead of what Nicole calls “bureaucratic government speak” and optimized the design for mobile devices. Since RI Votes went public last year, it’s been well received. In addition to promoting civic engagement, Nicole says that RI Votes reflects a growing emphasis on building civic pride and making it easier to vote in the state. 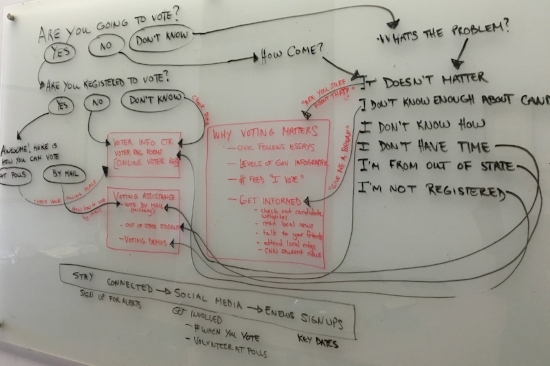 If other election officials are inspired by RI Votes and want to create interactive, persuasive election content, Nicole has some suggestions to keep the job manageable and affordable. As for RI Votes, the Department of State has ambitions to improve the site. Nicole is especially interested in transforming the “levels of government” infographic into a more interactive format, and she says the Department will make additional improvements ahead of the next election cycle. Has your election office found effective ways to promote civic engagement and reach out to low-turnout voters? We’d love to share your success story with our network of over 1,100 election officials. Email us at kurt@techandciviclife.org.